How Many Teeth Can Dental Implants in Lynnfield Replace? If you are missing one or more teeth, you’re not alone — most people over the age of 35 have suffered some level of tooth loss. Missing teeth can make you feel frustrated and take away from your overall quality of life, but there is an effective replacement option with dental implants in Lynnfield. Titanium posts that are implanted directly beneath the gum line, dental implants are the premiere method of tooth replacement. In this week’s blog post, let’s put the spotlight on just how they work — specifically, how many teeth can be replaced with implant dentistry. A single dental implant can be placed to fill the gap left by one missing tooth. The implant post will be placed in the empty socket and then allowed to heal over a period of several months. You may need to have a ridge augmentation procedure performed after the extraction or loss of a single tooth. This treatment preserves the arched shape of the tooth socket to create a sturdy foundation for the dental implants. Once the recovery period is complete after implantation, you return to your dentist’s office to begin the restoration of the single implant. If you had a temporary tooth replacement placed, it is removed and a connecting abutment is placed on top of the implant. Impressions are taken and a customized dental crown is crafted in a separate lab. The process usually takes one two weeks, and then you return to the office for the final restoration of the dental implant. 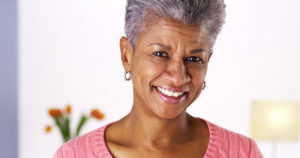 Maybe you’re missing more than one tooth — dental implants can still provide a wonderful solution. A partial bridge fills the gaps left by multiple teeth when there are still some healthy ones remaining in the gum line. For an entire arch of missing teeth in the upper and/or lower jaw, there are complete implant-retained dentures. Both of these implant-retained options can be fixed or removable, depending on your unique needs and personal preference. Choosing an implant solution is especially important for multiple missing teeth. When you have lost a tooth, your jaw also lacks the stimulation it needs to stay healthy and strong — and it will gradually deteriorate. When several teeth have been lost, disintegration of healthy bone tissue occurs even more rapidly. Because dental implants give you back a missing tooth’s root as well as its visible crown, they stimulate the jawbone and bring necessary blood flow and nutrients to the area. That makes it easier for your smile to stay healthy and whole for a lifetime to come. To conclude, it doesn’t matter how many teeth you have lost — dental implants replace them all. Many adults are good candidates for implant dentistry; don’t wait to find out if you are eligible, too. Get in touch with your implant dentist to discuss how dental implants can complete your smile today! Dr. Rob Schumacher is a reconstructive, cosmetic, and family dentist serving Lynnfield friends and neighbors. To learn more about his services — including dental implants — please don’t hesitate to contact Schumacher Dental at 781-334-3400. Comments Off on How Many Teeth Can Dental Implants in Lynnfield Replace?